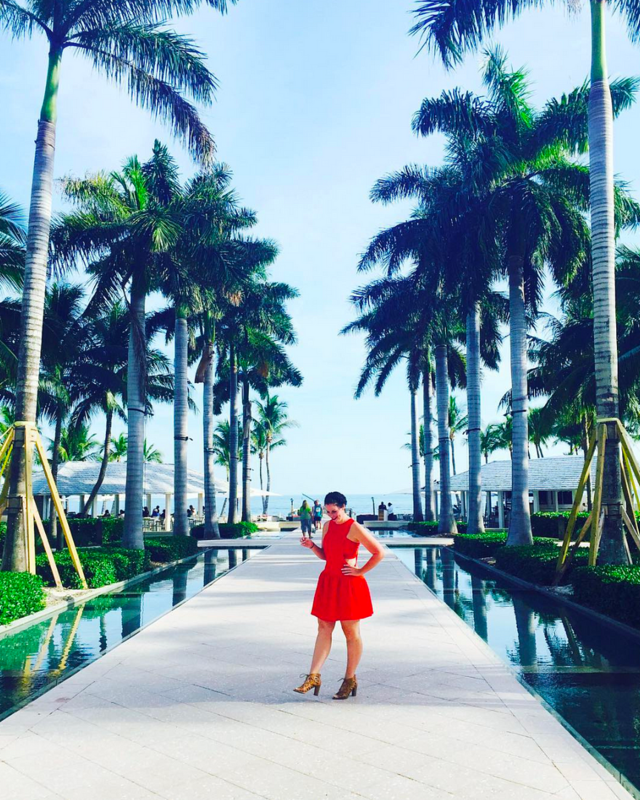 Some people start a blog to keep up with family and friends who live hundreds of miles away. Some people start blogging to get a bunch of free stuff. Some people start a blog to get clothes and shoes. Some people start because they are fantastic writers, and know they will be successful. 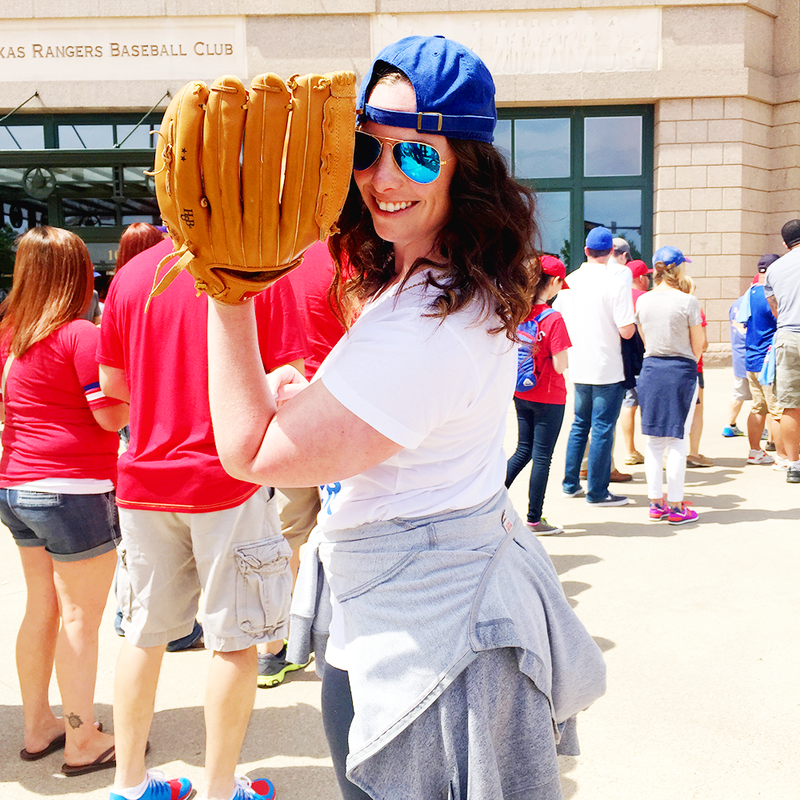 I started blogging in hopes of bringing females, a female perspective on the sports world. I wanted to be a Dallas sports blogger, with the hopes of ticket offers miraculously wafting through my email inbox. Although I only blog about sports 1-2 times per week now, my goals and dreams of the Dallas Cowboys and Tennessee Vols approaching me to be their official blogger still remain the same. Sigh. In the (sorta) words of Juicy J, "Ticketz a make her dance." 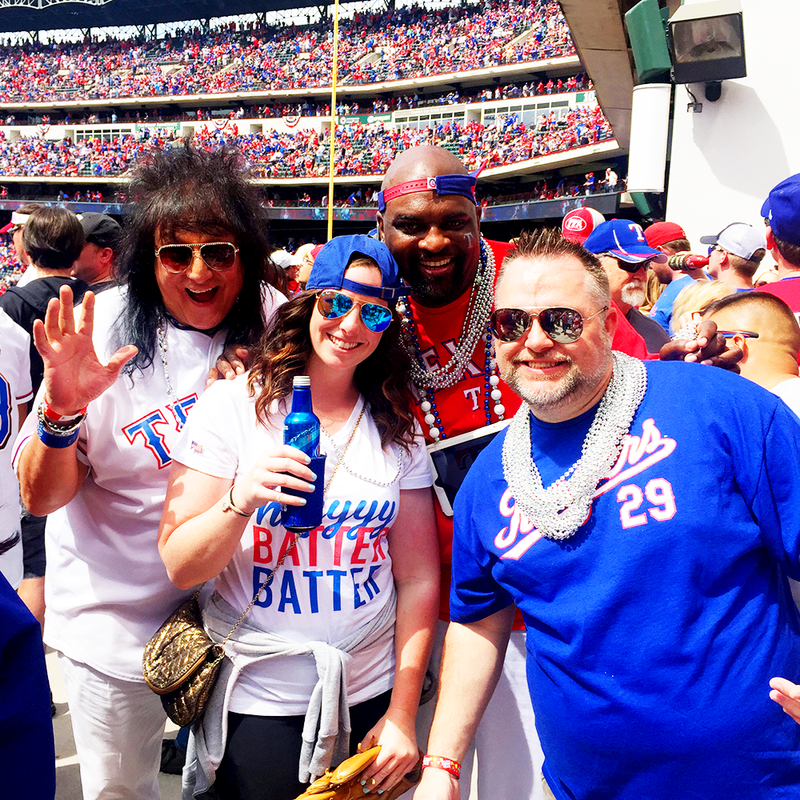 If you love tickets, like I do, DFW was the place to be this weekend with the Texas Rangers' Opening Day and the Duck Commander 500 at Texas Motor Speedway. I was one happy little girl to have tickets to both. 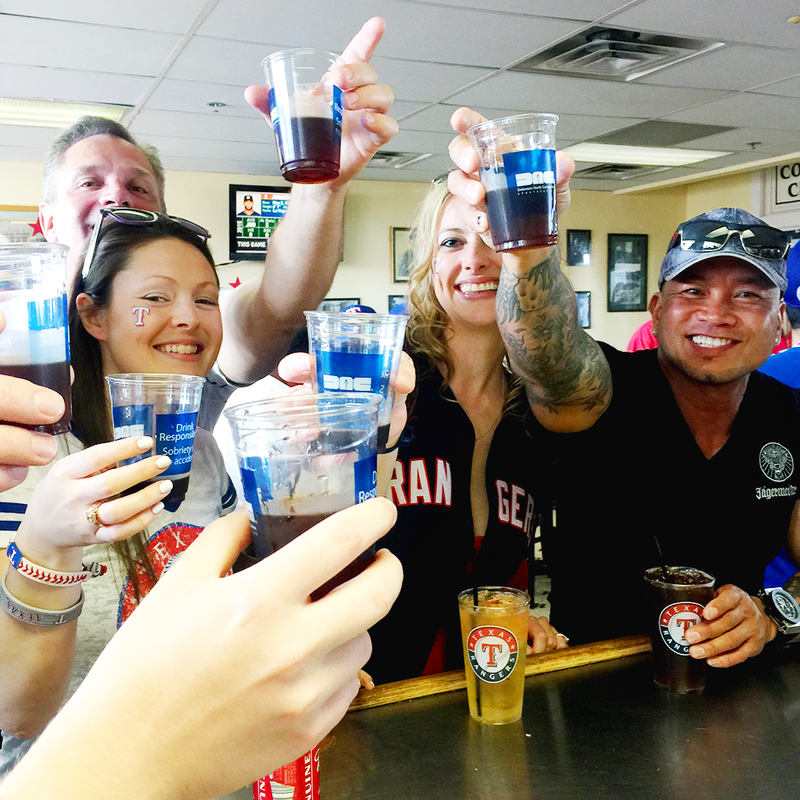 Now my Rangers' tickets were standing room only, but the full day tailgate was half the fun! And for a minute, it felt like football season all over again. Shirt from HERE Right as we started tailgating for the game, I had to say BRB to everyone because I had to run to a wedding. If you're a blogger and someone gets married in public right in front of you, and you don't go immediately and take pictures, I'm fairly certain your blogging card gets revoked. I didn't want to take that chance, so I bolted over to the tent next door. 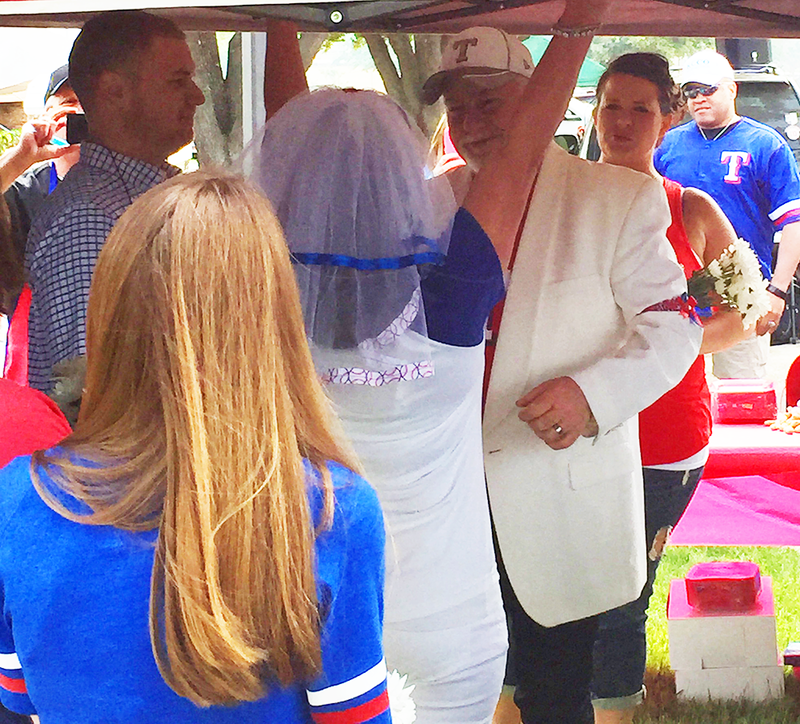 I'm a big fan of the tailgate wedding, for the record. 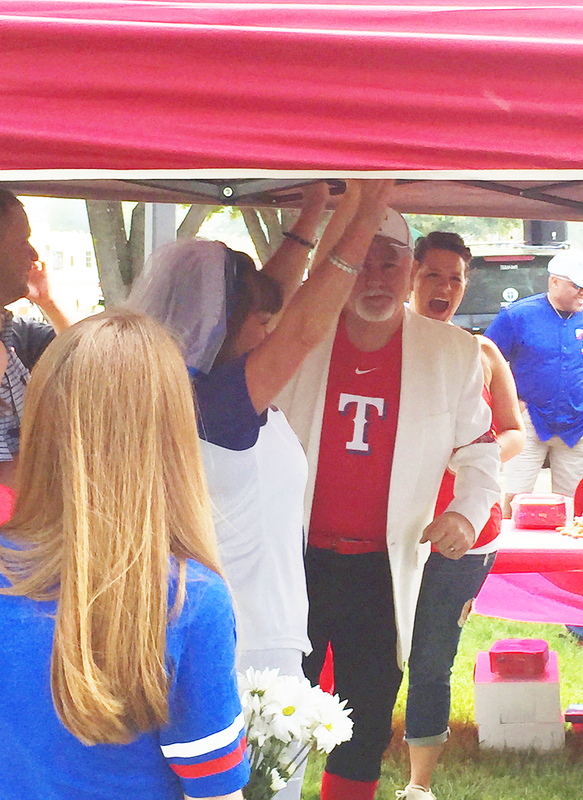 Soon after, all of the wedding guests the Rangers fans headed into the game to root our team on! 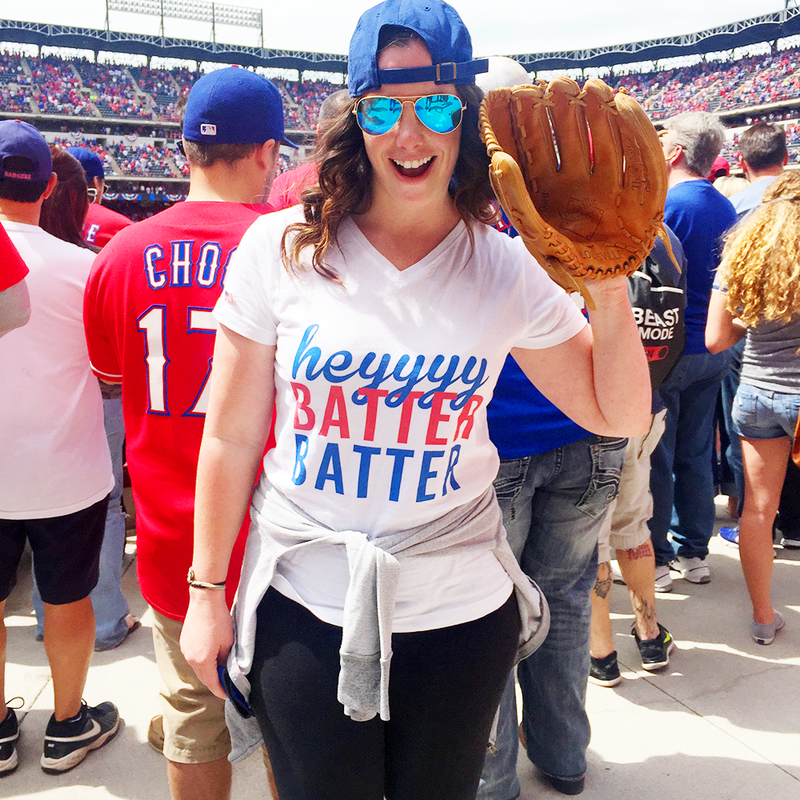 Baseball is back, can't you see the happiness written all over my face?! Since I didn't have an actual seat for the game, CB (who gave up his seat with his friends to hang out with me... awwwwe) and I ducked into a bar on the second level. We benefited greatly from these seats as these kind people purchased us a Jägerbomb. Now, I haven't had one of these in a very long time, so CB and I split it. Good decision. The Rangers lost, but they are still number one in our hearts. 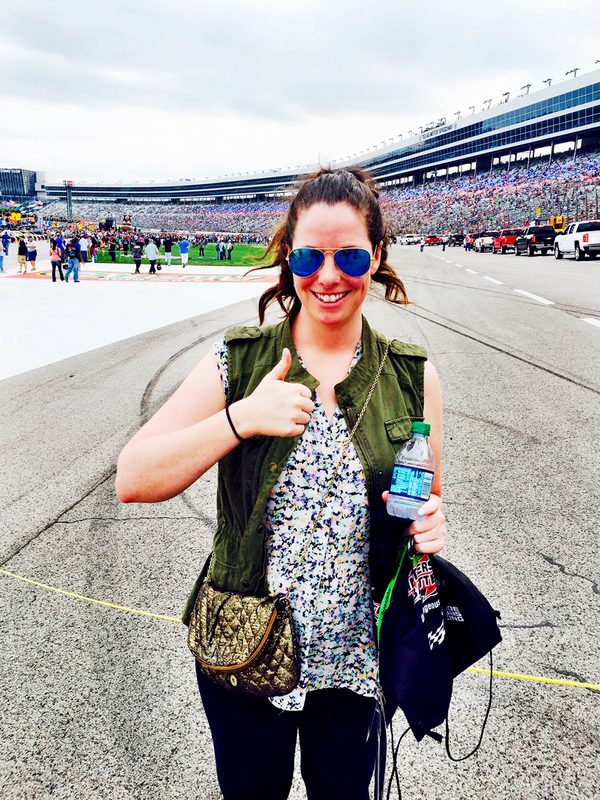 On Saturday, I had to get up, ignore my exhaustion level, and put my game face on all over again because it was time for the Duck Commander 500 at Texas Motor Speedway. I actually had great tickets for this event through a website I had signed up for a couple of years ago called Klout. I'd never received a Klout perk before, so I wasn't quite sure what to expect. 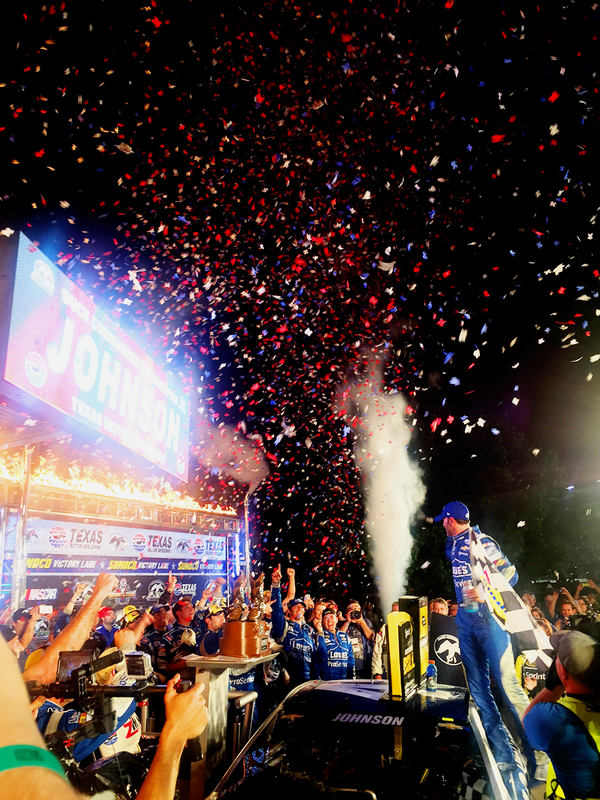 When I arrived at the track though, I found out I'd won a "Super Perk", and would get to go to Victory Lane with 3 of my friends after the race. How cool is that?? 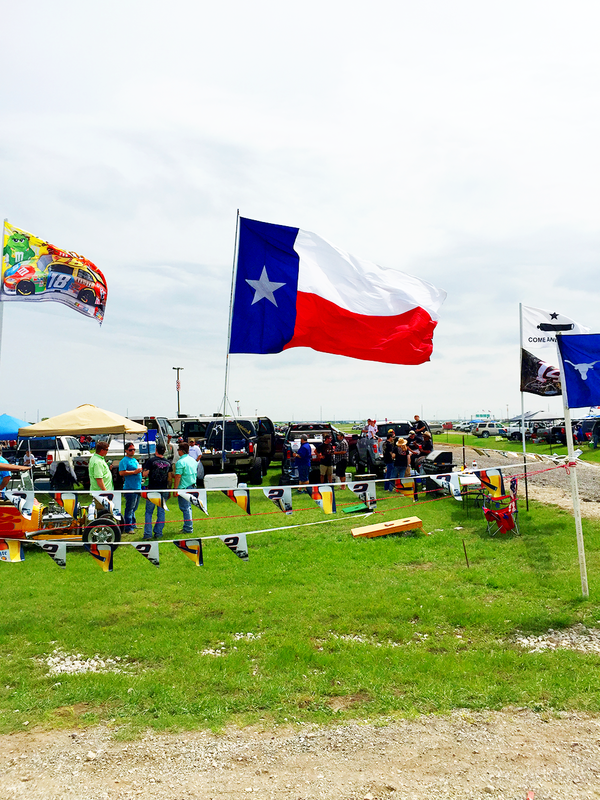 I had been to an IndyCar, and a Nationwide Series race, but never an actual NASCAR race. I might have to just retire from attending any more races, because I'm certain anything going forward will pale in comparison. 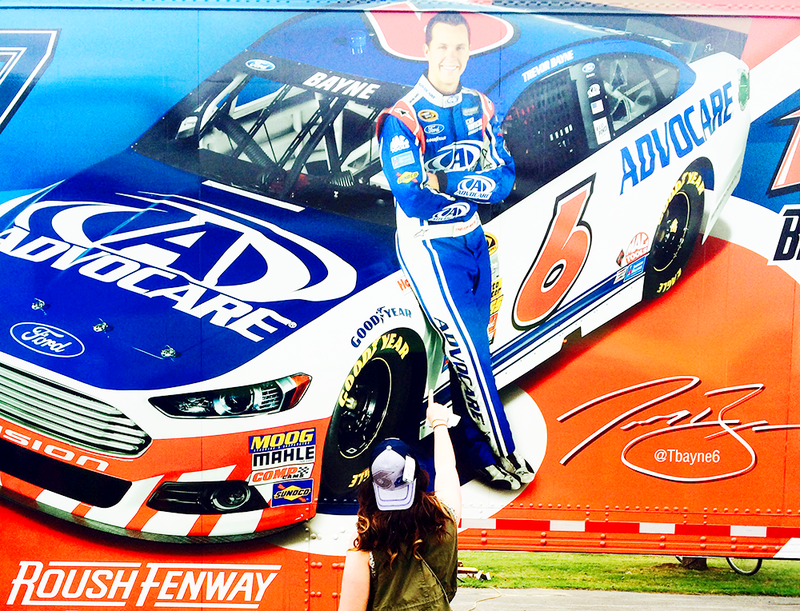 I promptly picked a driver to root for, #6 Trevor Bayne, because I had to represent a KNOXVILLE boy! He didn't win. 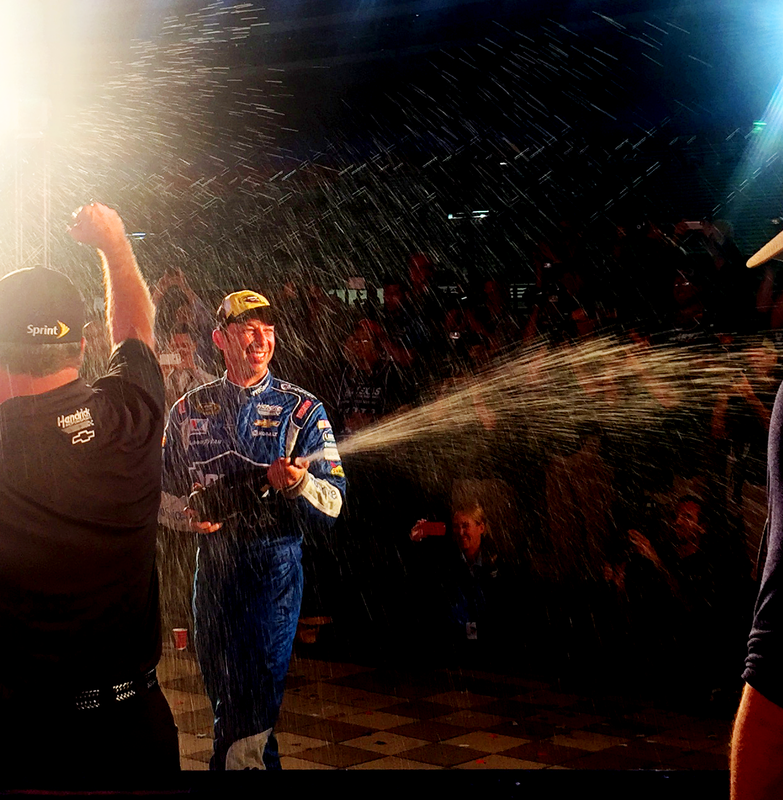 He finished in 18th place out of 43 drivers, but that's ok because I was still proud to be one of the few in the crowd that was reppin' #6. I also had "The World's Best" Bloody Mary. I'm not sure about, "The World's Best"... they must not have been to Anvil Pub in Deep Ellum. 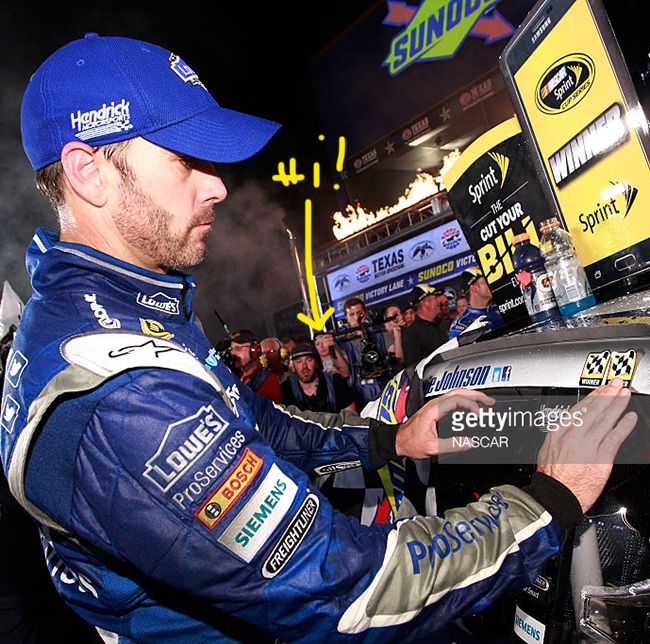 Pro Tip: If you go to the race, either bring Ear Plugs or rent a Scanner. Otherwise, you will be deaf when you leave. 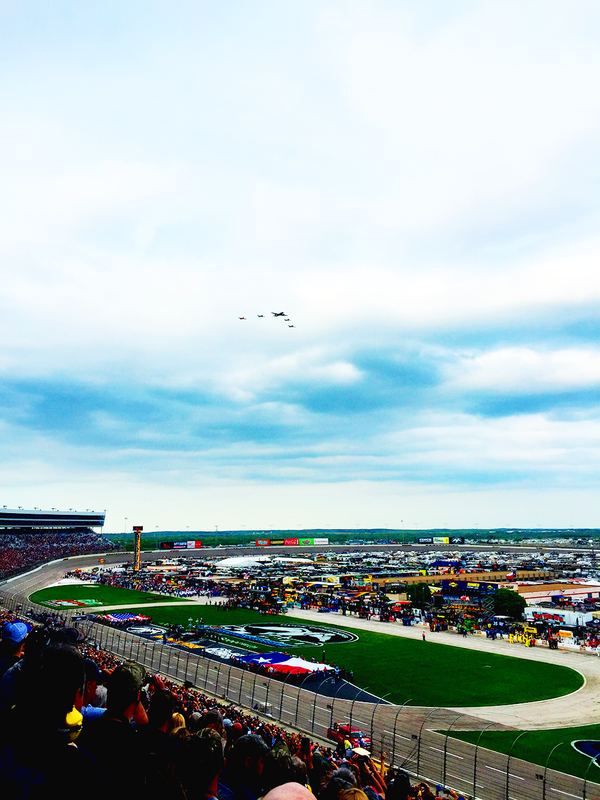 Loud doesn't even begin to describe the sound of the cars screaming through your ear drums for 334 laps. 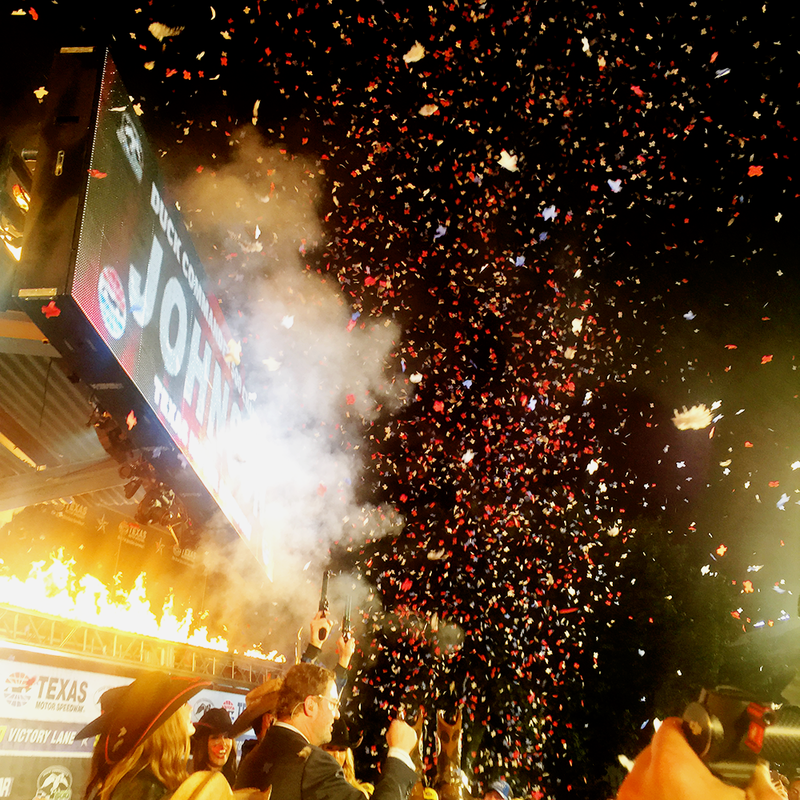 After the race, the madness happened. 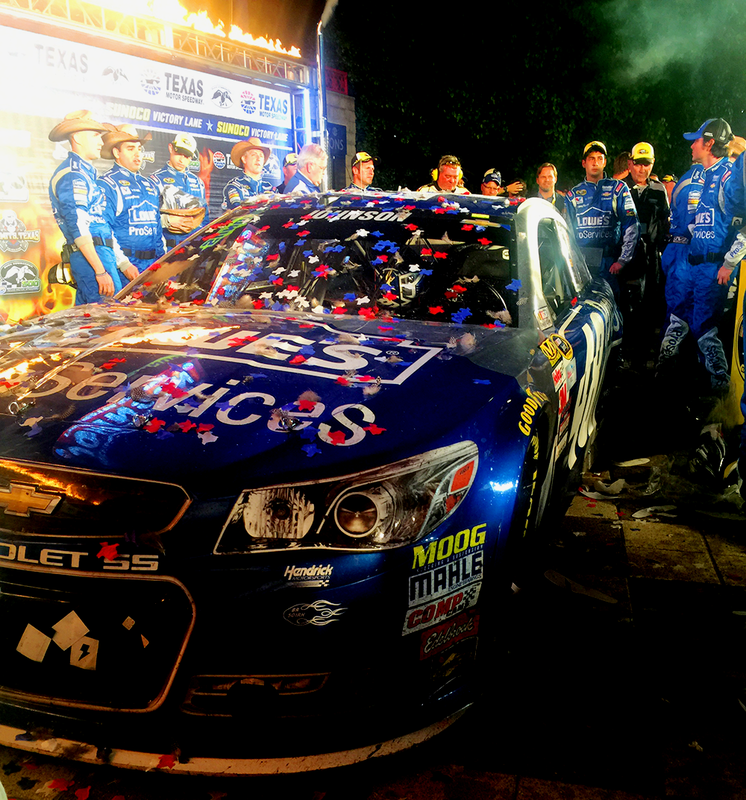 We got to watch the winner, Jimmie Johnson, arrive and celebrate in Victory Lane. 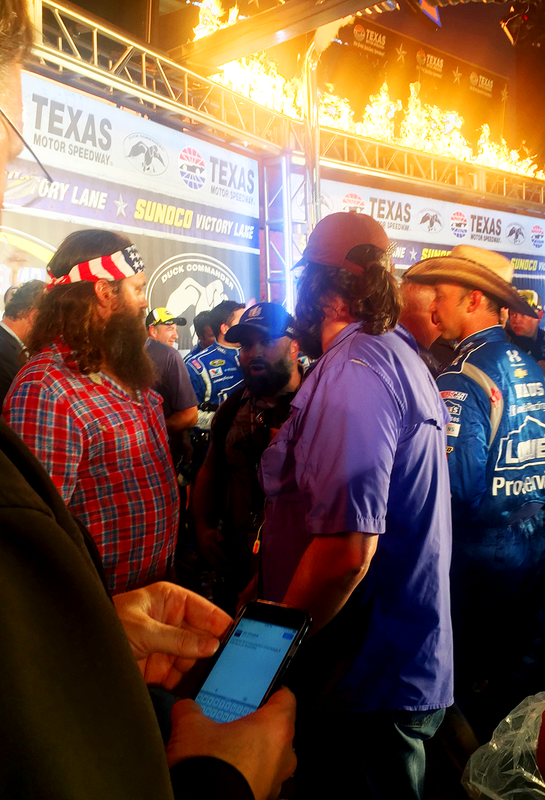 No big deal, just spent my Saturday night hanging out with Jimmie Johnson and the Duck Dynasty guys. 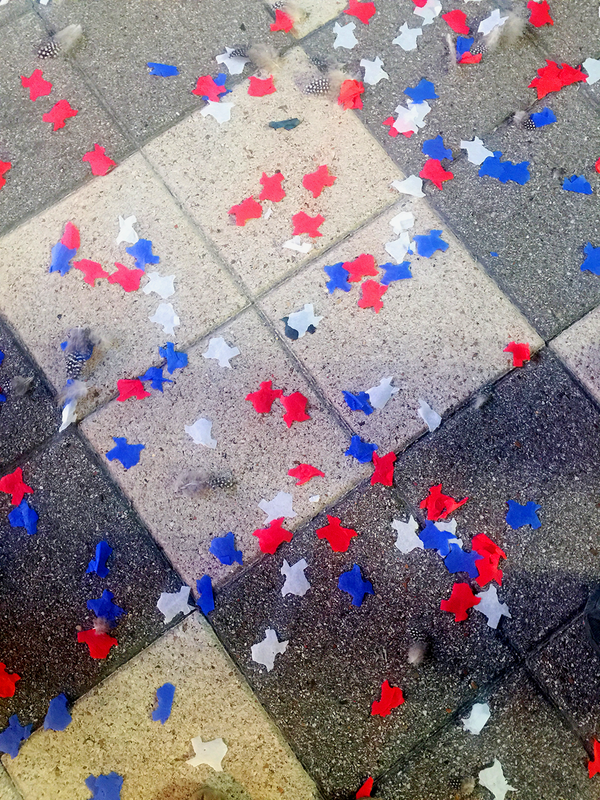 Texas shaped confetti. That is all. I was too chicken to ask Willie for a picture. Whomp whomp. It was all press, so I didn't want to be that girl. 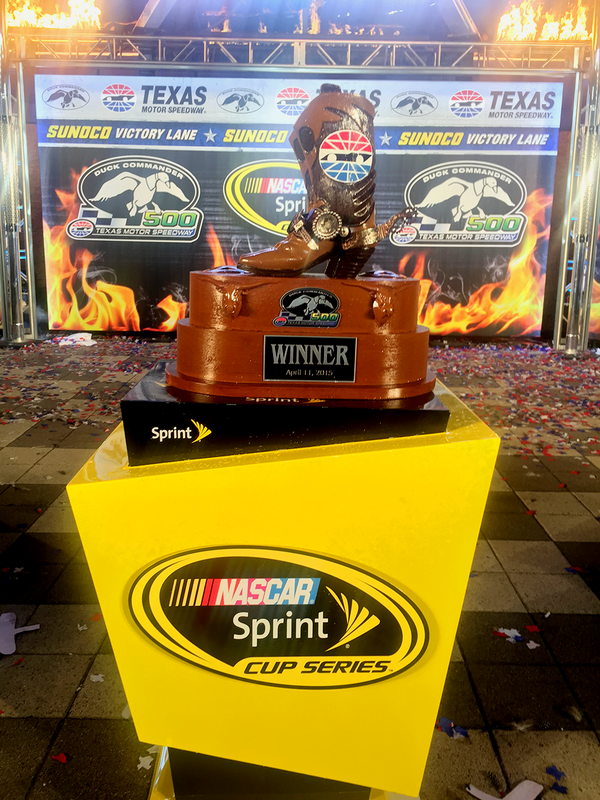 I did get to meet Jimmie though (first name basis now, duh), and take a picture with the trophy! It was about midnight and we had been there for 8 hours at this point, so excuse me looking like a goober! Whew! This was a long post, but everything was equally important, too important to skip. See, there I am....... CB can't be far! First of all, this looks like a crazy ton of fun. 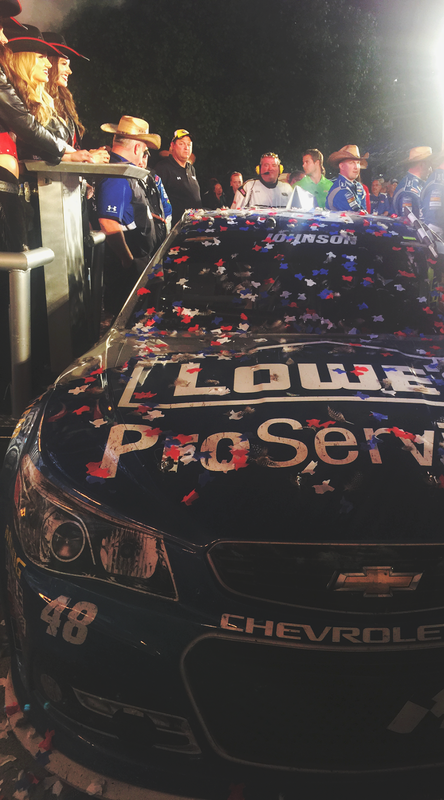 Second, I'm not at all surprised that there was Texas shaped confetti. this is so awesome!! 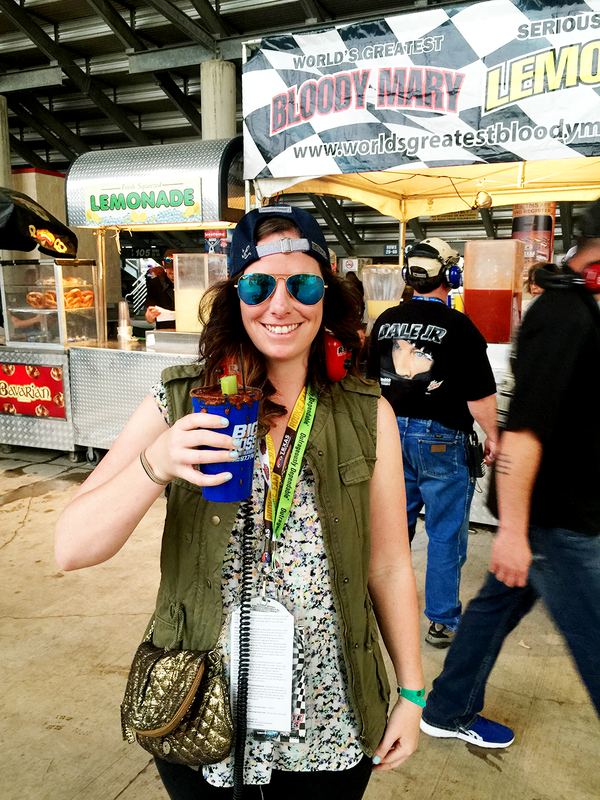 you truly had a sports filled weekend (even with soccer sunday!!) these pics are incredible. 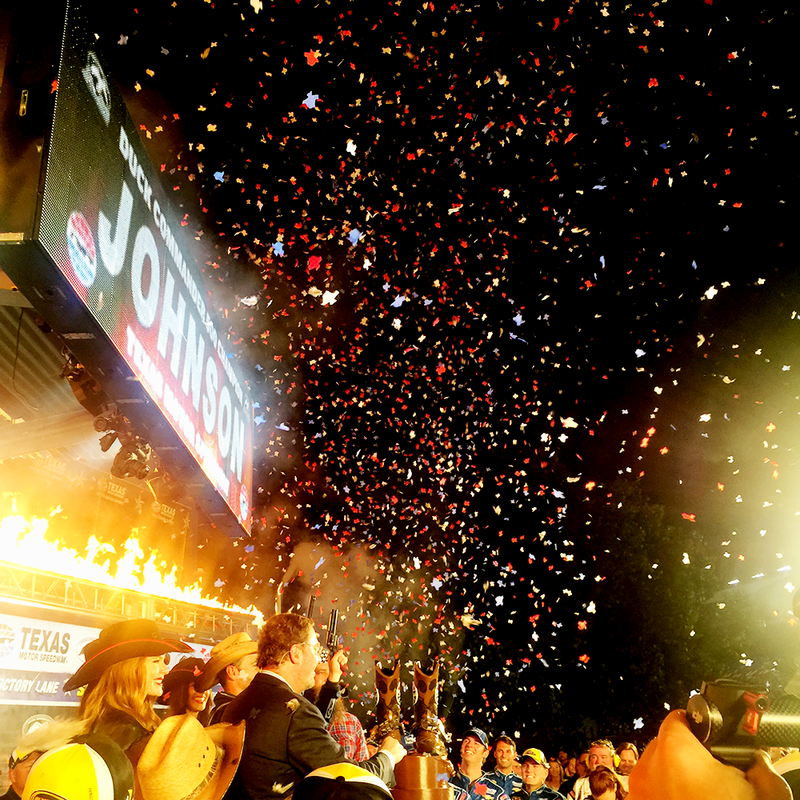 And I can't get over the texas shaped confetti. i need some of that. I'm dying over the baseball wedding!!! My husband's uncle was at the game this weekend- he's a huge Dallas sports fan! I myself am a football wife, so sports are right up my alley! Looks like you had a great weekend! shut the front door! this looks like quite an outstanding weekend to me! I always get klout emails that I've unlocked the opportunity to enter to win a coupon. I'm like, yeah, cool story bro. Waaaaaaaah!!!!!!!!!!!! 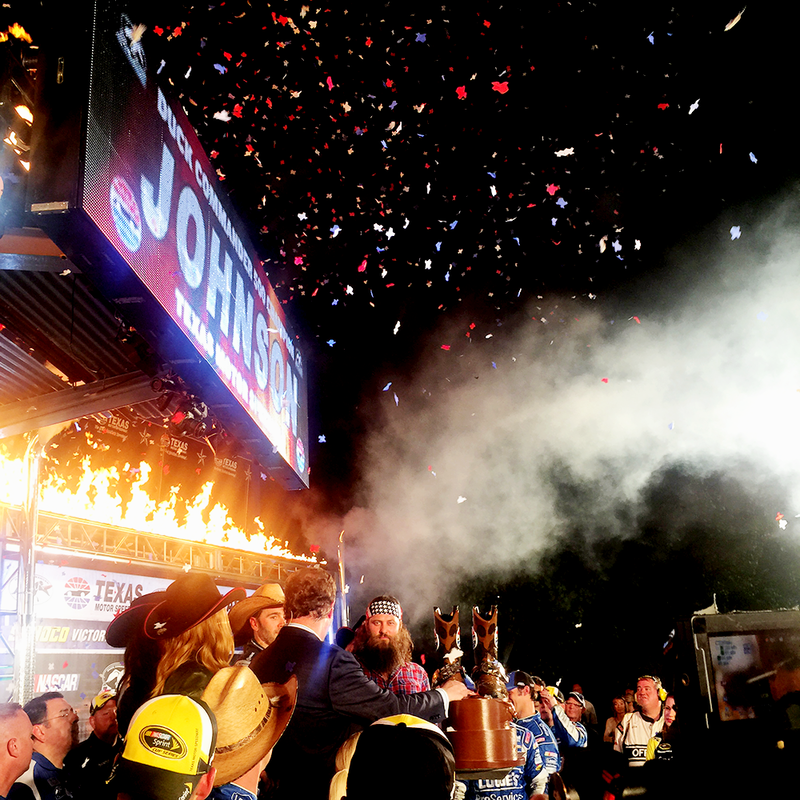 I'm SO jealous you got to meet Jimmie!!! 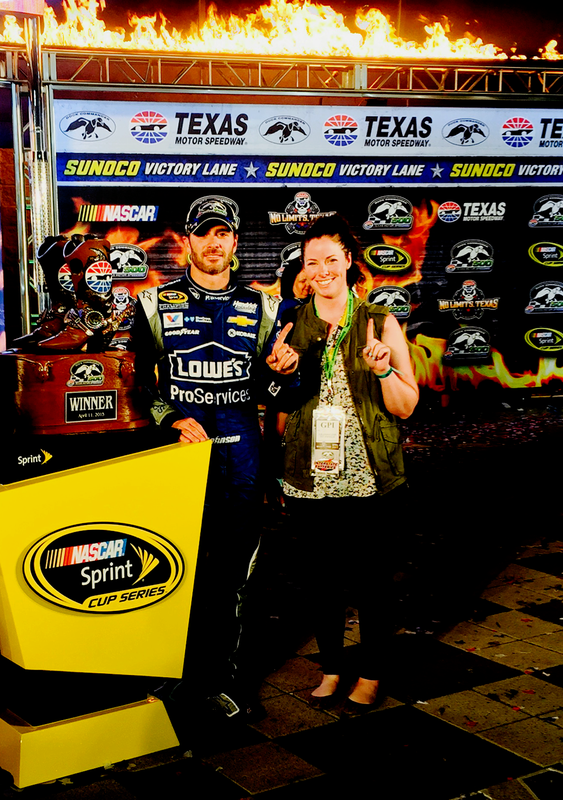 And now I know the reason why he won...you were the good luck charm there fore me ;) He's been my favy driver forever...I can't ever resist a handsome scruffy beard driving a fast car. 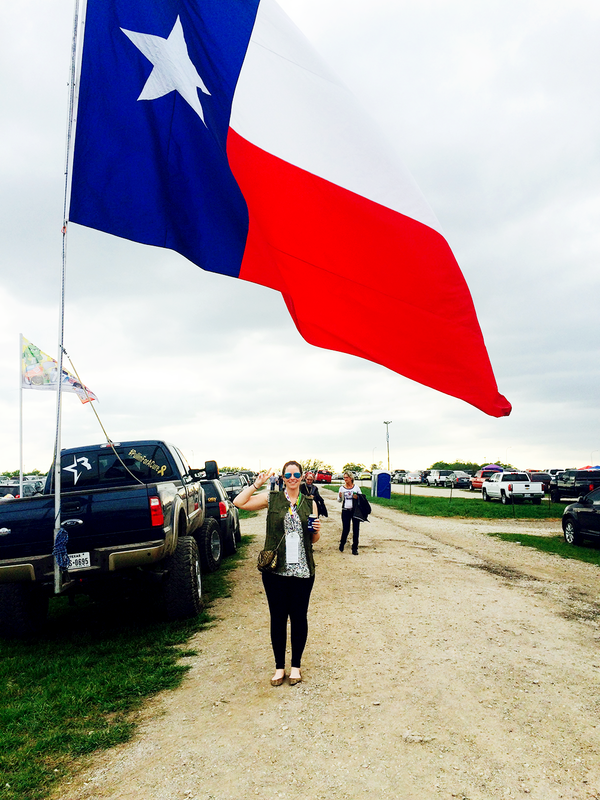 A weekend for the books FO SHO! So fun! I am not a sports fanatic at all but I love watching anything live! Awesome pictures too by the way! But seriously- how do you always look so adorable?! Every photo girl- you are a hottie!!! ;) What a fun day and that tailgate wedding?! Omg- I kinda' love her veil. I'm so pissed that I booked a wedding venue last week. 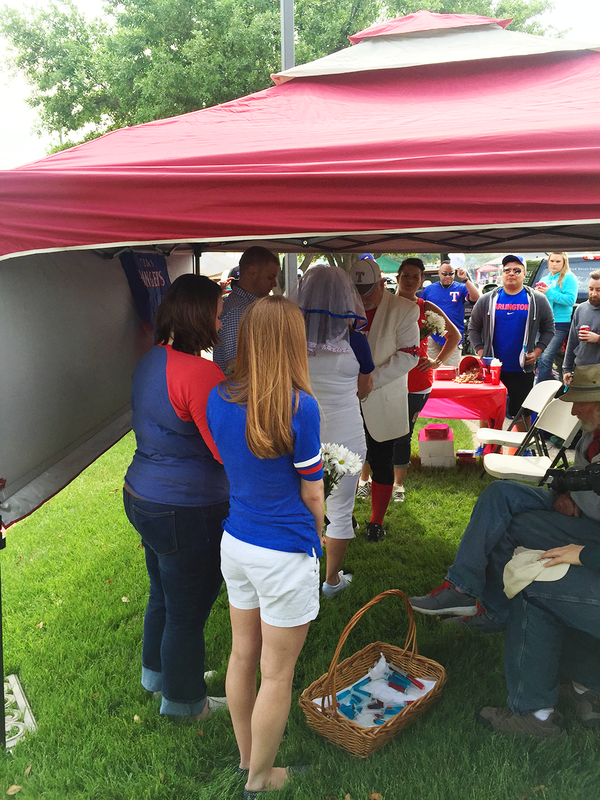 A tailgate wedding is SUCH A GOOD IDEA! 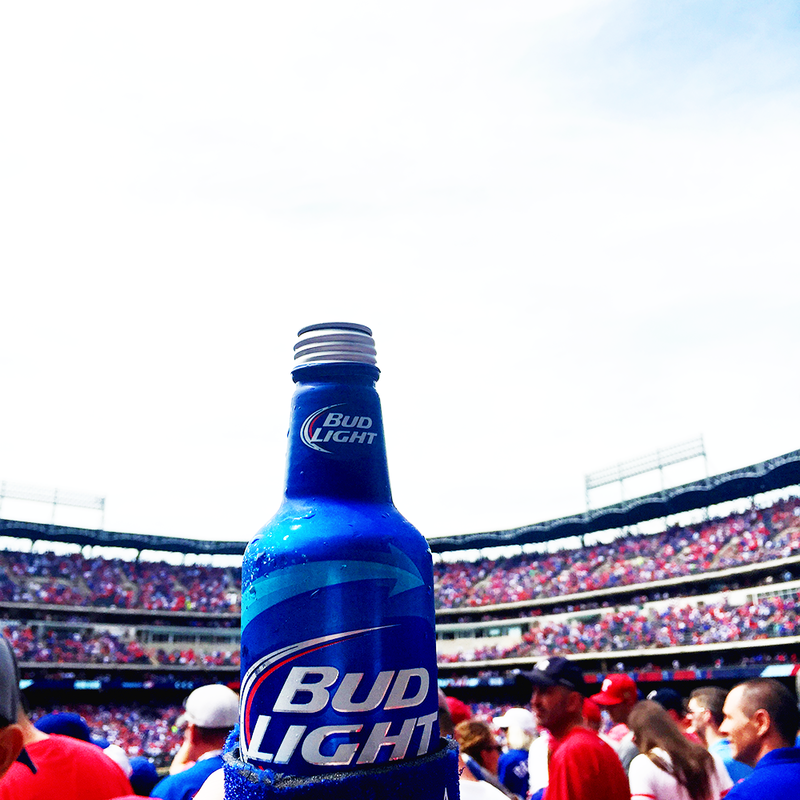 Looks like your weekend was a blast! Yay for baseball!! So glad it's back! 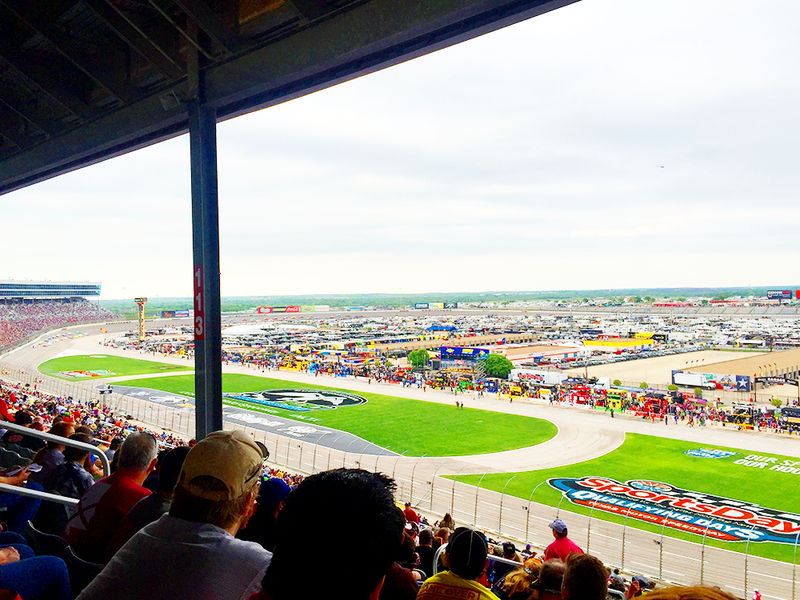 As for NASCAR, I'm really not a fan, but I want to check out a race one of these days. What a FUN weekend! 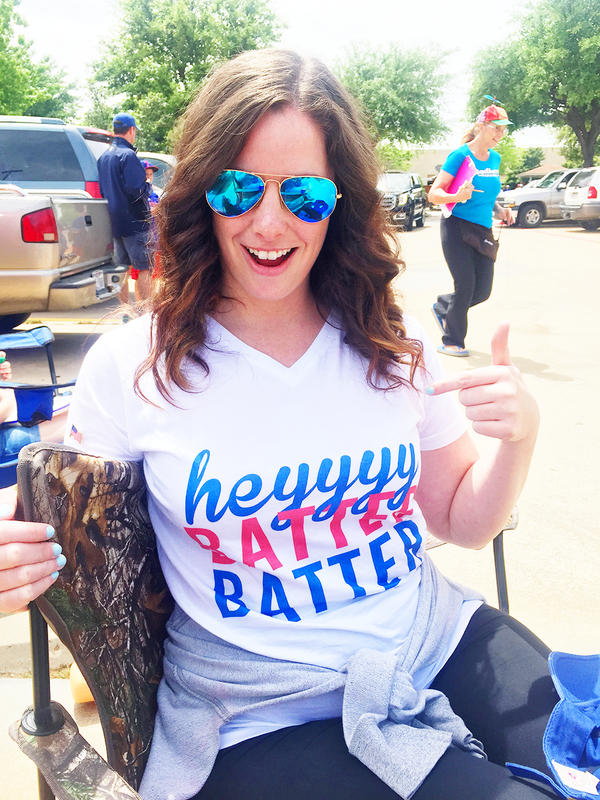 I love your batter batter shirt, I might have to order one! Soooo 2 of the people that bought you the Jager bomb are definitely my bosses! You just successfully made me miss Dallas for the first time since I moved to Austin four years ago. I've never been a sports fanatic, but I always had a great time at various sporting events, and that's something we don't have much of here. Looks like a blast! Wow what a fun weekend! 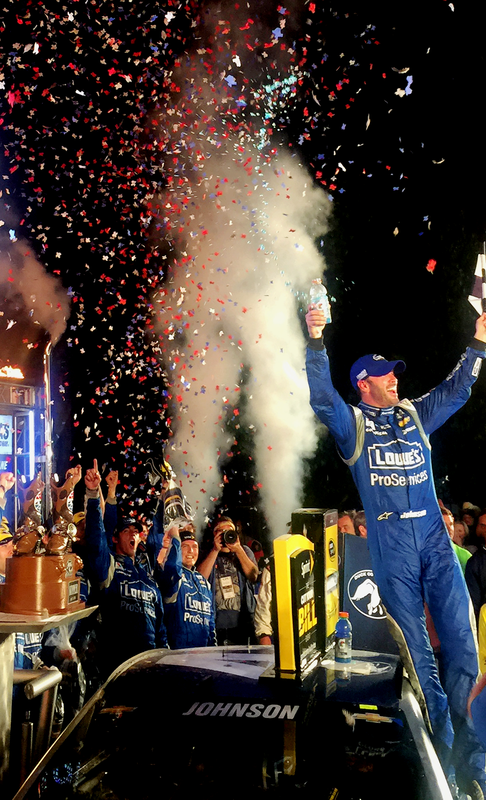 So cool that you got to hang out with Jimmie and the DD guys! So glad you had a great time! I still don't have my tickets for Bristol. The people I usually go with are acting like they don't want to go this year. I think getting married at a ball park beats my getting married at a hair salon story all to hell. Great pics. I got my tickets for Sonoma and the road race in June. baseball wedding?! amazing. 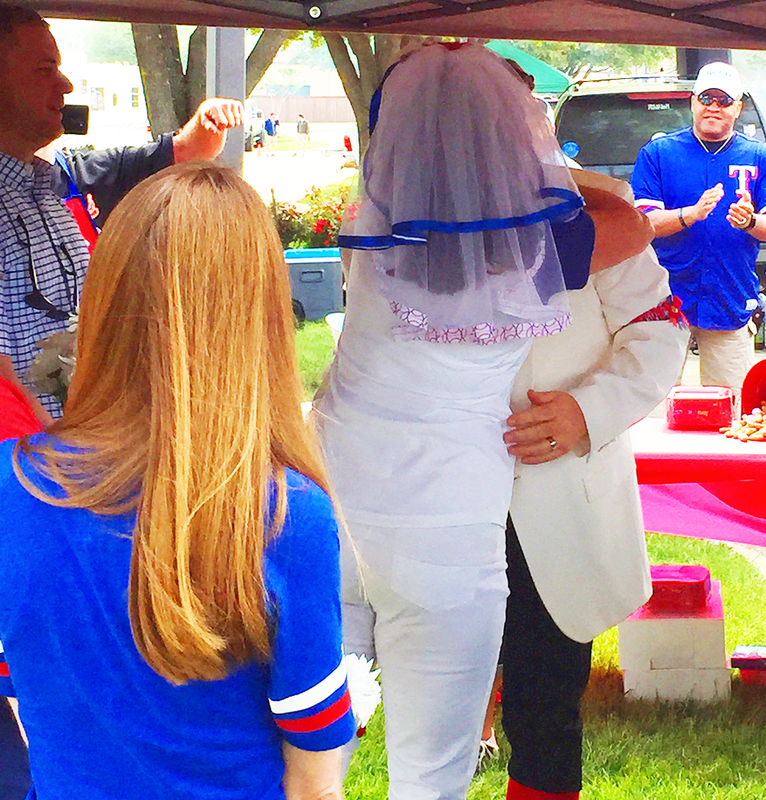 her veil was especially great with little baseball fabric at the end...much more tasteful than i would have imagined. 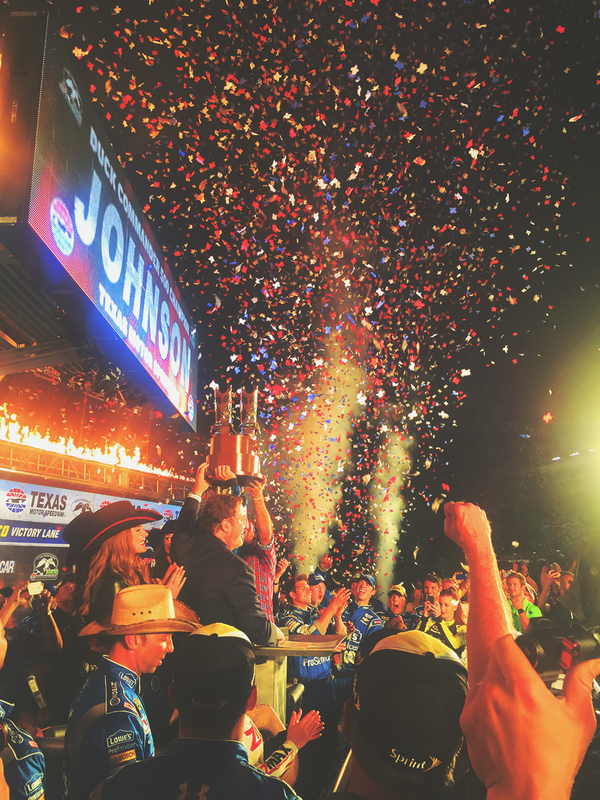 i will also need to find texas shaped confetti for my texan husband because he may very well pass out. looks like an action packed weekend! My husband and I had our wedding reception at Chicago Wedding Venues. It was absolutely perfect! The manager and his staff were excellent and wonderful to work with. You won't be able to find more for your money.